Among the bevy of celeb looks spotted ‘Suron Ke Rang’ event recently held in Mumbai, one particular look stuck as our festive fashion inspiration. 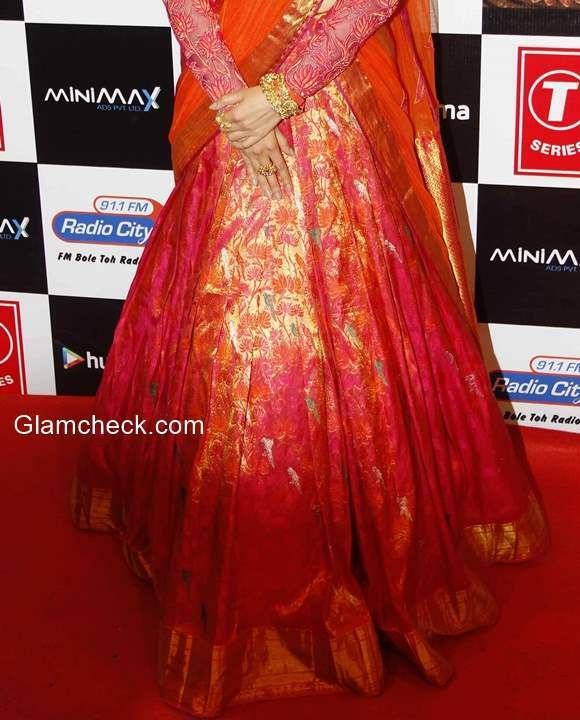 And that was Divya Khosla Kumar in a gorgeous Neeta Lulla lehenga suit! We term this suit perfect for the upcoming winter festivities, here’s why. First, the colors on the lehenga with its feminine pink, bright orange and rich gold form a cheerful combination. The lotus embroidery all over the body of the skirt and the sheer blouse further adds to its grandiose appeal. For the styling, Divya decided on heavy traditional gold jhumkas, bracelets and finger rings by Gehna Jewelleries. And then, mogra flowers as hair accessories for that traditional touch. To complete the festive finery, she brought light pink lips, perfectly winged eyeliner and a tiny bindi. That’s just the look that gets one in the mood for some festive merriment. What do you say?